Though it didn’t go exactly as planned, Virginia Wesleyan University’s 2019 Spring Alumni Weekend was a special occasion to remember. With heavy rain in the forecast, several cancellations and postponements affected the weekend’s outdoor events. Marlins still gathered, however, for the Alumni Social at ShoreBreak; at alumni games for men’s and women’s soccer, field hockey, and volleyball; and for the VWU production of “Legally Blonde – The Musical”—the first theatre performance in the new Goode Fine and Performing Arts Center. The President’s Parents Roundtable also met on campus for their spring meeting, which featured several presentations and updates on VWU capital projects and initiatives. 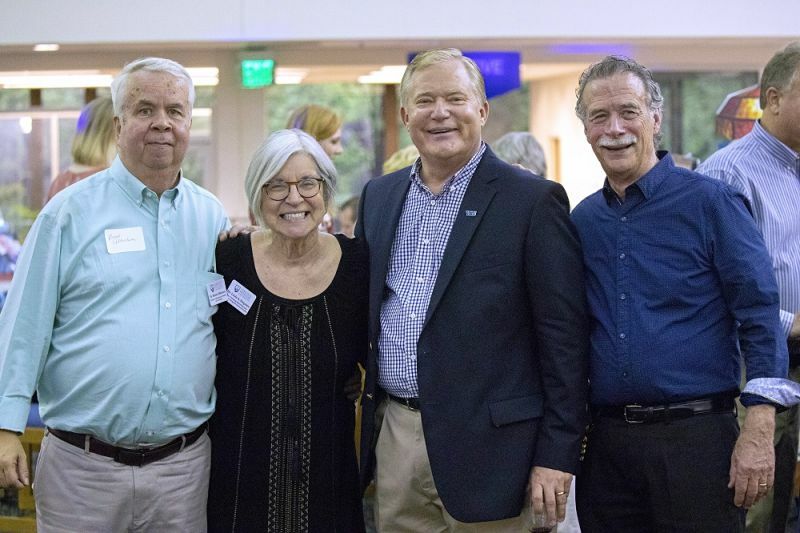 Graduates and friends filled Hofheimer Library on Saturday evening to offer well wishes to business professors Bob Albertson and Dave Garraty, who retire this academic year after four-decade careers at Virginia Wesleyan. The retirement celebration also supported the Robert “Beau” Cass Endowed Professorship, named for the founder of the LAMP program. For more information or to provide further support, contact Linda Ferguson, Dean of the Birdsong School of Social Science. Among the postponed events were the Scroll Signing for the Class of 1994 (reschedule date TBA), the VWU softball program’s 11th Annual Strike Out Cancer event, rescheduled for April 20, and the State Farm/VWU Scholar-Athlete Recognition Ceremony, which will now take place during the Athletic Department’s annual Bob Awards.